Rizespor and Besiktas will complete Matchday 27 in the Süper Lig on Monday night. While the Black Sea club with the success trend under the new coach Okan Buruk has given some air in the relegation battle, also Besiktas could last victories over victories. For Besiktas, the title race seems to have run long ago, especially since the gap of eleven points against Basakshr is no longer really catch up. Senol Günes, coach of the “black eagle”, will finally leave the team in the summer and focus on his job as a national coach. In his last season as Besiktas coach Günes wants the best possible result. If the Günes-Elf wins in Rize too, lucrative odds can be won by Rizespor vs Besiktas. A success of the home side is at Rizespor. Besiktas, on the other hand, was rewarded with odds of 3.40. Okan Buruk was already known as Akhisarspor coach for taking points against the top clubs from the Süper Lig. Undoubtedly his greatest success as coach was the cup win with Akhisarspor. As a coach of Rizespor Buruk is now expected to succeed in the league. In the last nine Süper Lig games Rizespor had to give only once beaten. Now follows the next Buruk strike against Besiktas? On Monday evening, the duel between Rizespor and Besiktas at 19:00 clock in the Caykur Didi Stadium rises! Rizespor has acted quickly at the beginning of the season and made a change of coach after a catastrophic start to the season. It was not long before a new candidate for the vacant post of Ibrahim Üzülmez was found. With Okan Buruk Rizespor wanted to master as a climber the season in the Süper Lig. The desired success remained partially under Buruk, yet the coach was strengthened the back. After mostly mixed performances in the first round, Rizespor starts right through in the second half. Only one of the last nine Süper Lig games has been lost. The only defeat was in the minority despite strong fighting performance against Fenerbahce. Four of the last five matches were won by Rizespor last time without conceding a single goal. In the second half Rize is thus one of the strongest teams in the Süper Lig. With a strong second round record of 7-1-1 and a goal difference of 18: 5 only Basaksehir and Galatasaray were better than the Black Sea club. Currently, Rizespor ranks tenth in the table and has a lead of seven points to a relegation rank. Under Buruk the relegation for Rizespor should be almost natural with the current cushion. With three points behind fifth-placed Malatyaspor, the Black Sea club can even dream of a starting right for the Europa League. However, the fifth place in the table will only be interesting if Galatasaray win the Turkish Cup. On offense, Okan Buruk benefits from his nimble and tech savvy players. Vedat Muriqi leads the internal scorers list currently with eleven goals and seven assists. Braian Samudio, who played a major role in Rize’s promotion last season with a strong goal (20 goals), has scored nine points. Buruk will not make big changes in the match against Besiktas. Umar Aminu, who was injured for the last time, is back in the squad. With the strong trend from the second half, Rizespor is not a big underdog against Besiktas. With the home advantage at their side should be kept in Rizespor vs Besiktas a prediction in favor of the hosts in the eye. Senol Günes will leave the team permanently in the summer. Already during the season rumors were in circulation, Senol Günes would take over the post as national coach. Now Günes took the national coaching post prematurely and led the Turkish national team to the first two successes in qualifying. With Besiktas it has not worked very well for Senol Günes lately. However, this was not necessarily the coach, but rather the transfer policy in the club. Top performers could never really be adequately replaced, which meant that Besiktas lost dominance. This season, the “black eagle” occupy the third place in the table and have eleven points behind no hope for the title. Third place would be the best possible season finale for the Günes-Elf. With 51 goals Besiktas behind Galatasaray represents the strongest offensive of Süper Lig. In the second half Besiktas meanwhile continues to be unbeaten and was able to build up a balance of 6-3-0. A total of 2.55 goals per game were scored in the nine games back. With Rizespor meets the Günes-Elf on a rather unpleasant opponent, who is also convincing on the road in the second half of the season. Although Besiktas recently lost none of the last four away games, but the last time the “black eagle” in the 2: 2 draw in Kayseri but came off lightly. At the last minute Erkin brought on the template of Quaresma the traditional club from Istanbul still the one point win. With 14 assists, the Portuguese Ricardo Quaresma continues to be the most important offensive player in the squad. However, after the departure of Talisca and Babel, “Q7” has a big burden to bear. It is quite possible that the paths with Quaresma will separate at the end of the season, especially as the Portuguese has previously flirted with a departure to his homeland. 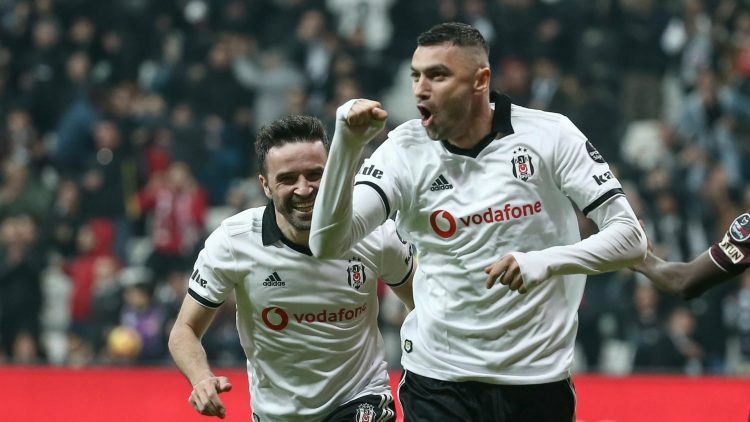 With currently six goals and one goalkeeper, winter newcomer Burak Yilmaz leads the internal scoring list at Besiktas. Shinji Kagawa, who was received with great euphoria in Istanbul, had only two starting eleven appearances so far. In his 254 minutes of use Kagawa but could already record three goals and a goal. Senol Günes complains in the away game against Rize no failures. For the 36th time Besiktas and Rizespor will face each other in the Süper Lig. Besiktas leads the direct comparison with a balance of 22-6-7. The traditional club from Istanbul won their last six matches against Rizespor. The last six away games at Rize were also not lost. Five wins and one draw have been added to Besiktas’ last six appearances in Rize. Since September 2005, Rizespor has not won a home game against Besiktas. In the first round Besiktas could prevail against Rizespor in a 4-1 win confidently. The guests from Rize, however, were in double outnumbered. Rizespor is in impressive form and has finally found under Buruk. Already at Akhisarspor Okan Buruk did a good job and even helped the Anatolian club win the title. With Rizespor the strong trend in the second half of the season should also be continued against Besiktas. With a home win, Rize can catch up with five-placed Yeni Malatyaspor and will certainly not miss this chance. Meanwhile, Besiktas lets the season end and only wants a solid season end – in this case, the third rank – book. ⭐️ Rizespor is one of the three strongest backround teams in the Süper Lig! ⭐️ Besiktas has not lost a game in the second half of the season. ⭐️ With a win, Rizespor can catch up to fifth-placed Yeni Malatya. It does not say much at Rizespor against Besiktas for a prediction in favor of the guests. Rizespor is in impressive shape, also Buruk can draw on Monday evening from the full. Convincing performances were searched almost unsuccessfully at Besiktas this season. Victory victories over teams like Antalyaspor should not be over-praised, especially as in those games had just voted the chance exploitation. We think that in the first half Rizespor will set a signal against Besiktas and therefore recommend against Rizespor. Besiktas the tip that the hosts win the first half, for which we choose a use of four units.